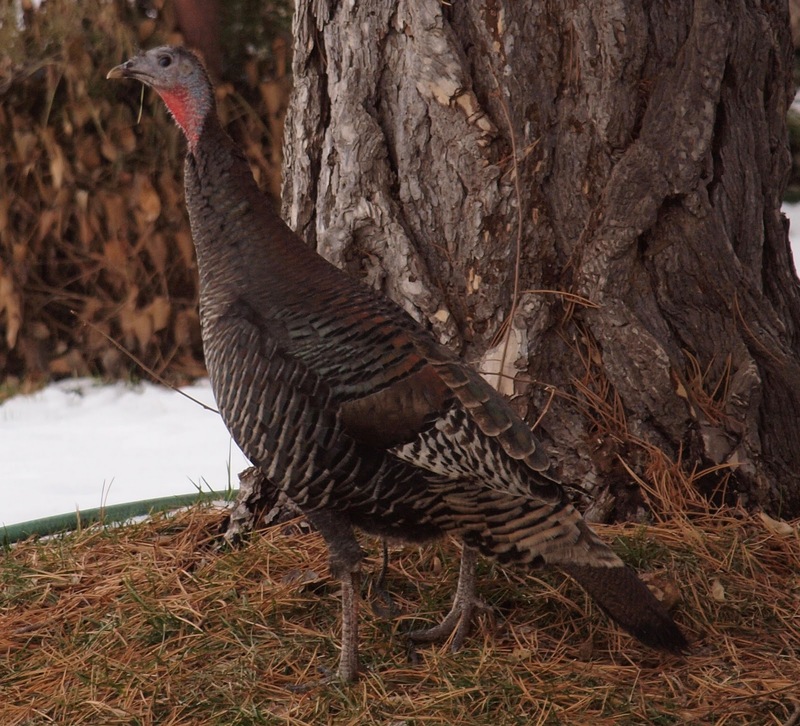 As it turns out, the neighbors have been seeing this lone Turkey since last Spring. Some other neighbors have been feeding it, so it seems to have grown accustomed to the neighborhood. 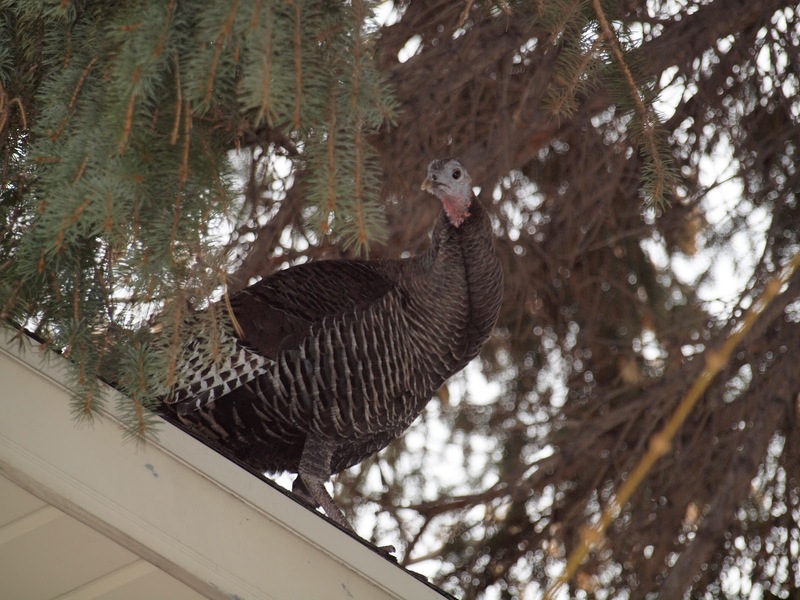 An hour later, my son reported that the Turkey was on our roof. 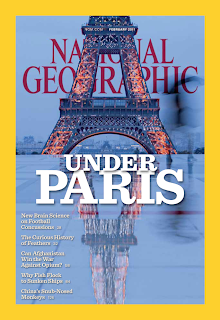 This week I picked up the February edition of National Geographic magazine while traveling. There is a fascinating article that discusses the evolution of feathers, even calling birds "dinosaurs using feathers to fly". 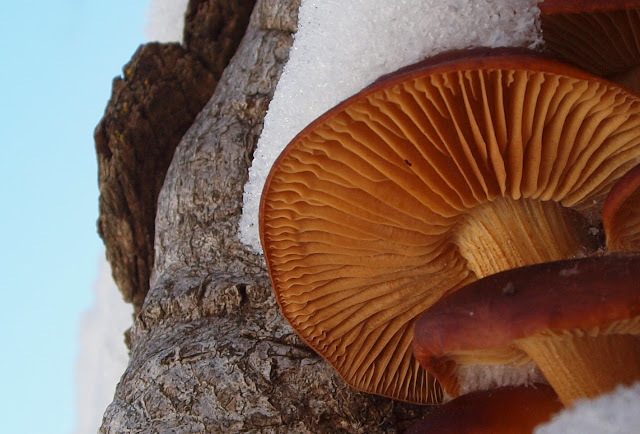 The article is written by Carl Zimmer with photos by Robert Clark. 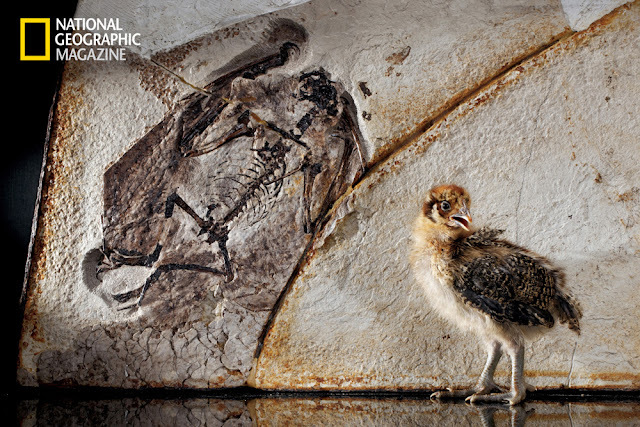 There are artistic renderings of the dinosaurs and what their early feathers might have looked like. I thought it was pretty cool to see how they are using new technology to determine from feather fossils what colors the feathers would have been. The article is really great and I spent most of my flight between Phoenix and Salt Lake studying it. You can read the article here and check out some of the photos here. 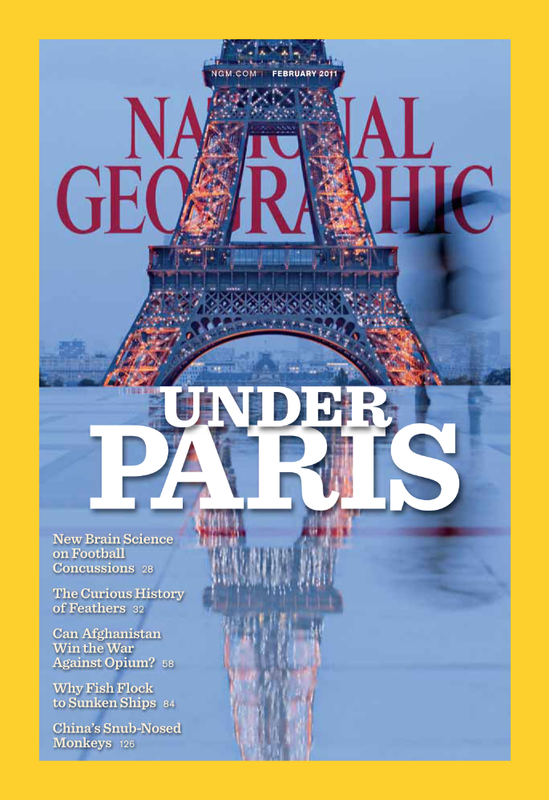 To get the best experience, pick up the February 2011 edition at your local newstand or subscribe to NatGeo here for just $15/year. My mother was my birding mentor when a small child and she fed birds in winter. My hook bird experience was a Green Heron when I was 9 years old, and as they say, the rest is history. Can you tell us the story behind the Green Heron? 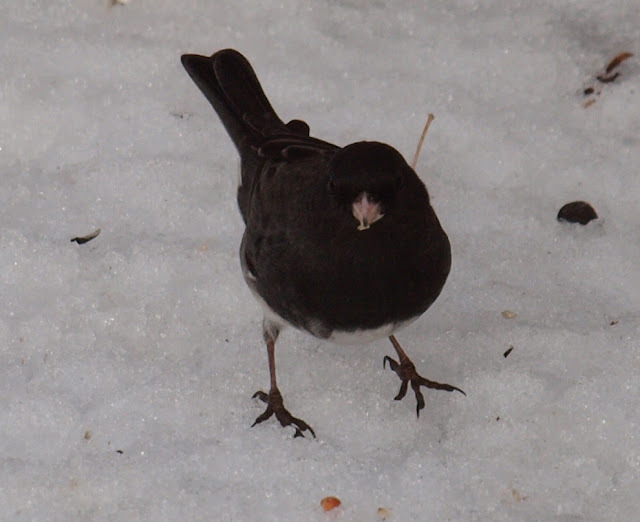 When I was just five years old, I can remember my mom throwing bread crumbs on the snow in winter for house sparrows to eat. These birds were interesting to watch but they were not hook birds. A few years later when I was 10 years old, I saw a strange looking bird while fishing along the Chester River in southeastern Pennsylvania. I had no idea what it was. At that age, I could have told you what a house sparrow, starling or a robin was but that was the extent of my bird knowledge. 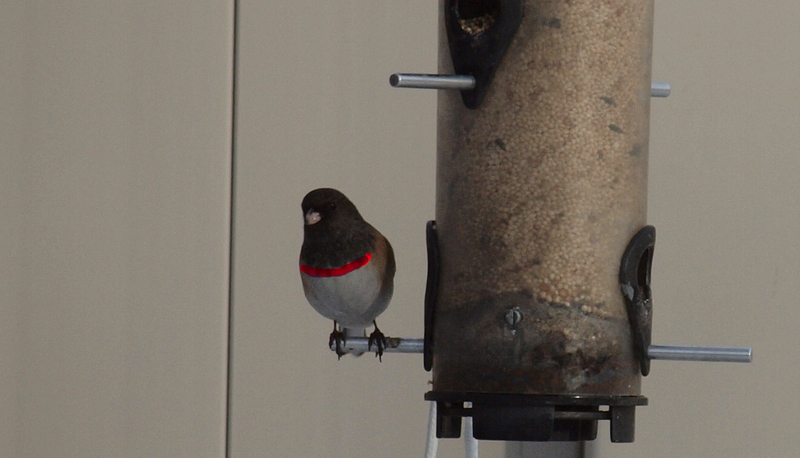 However, this bird was like none of those familiar birds. It was perched on a log, close to the water surface. Its bill was long and pointed. The bird was motionless, like a statue, watching small minnows swimming ever closer to its position. 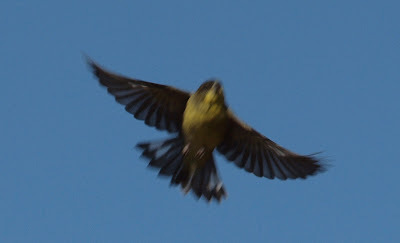 It was a slender bird, I noticed with blue and green feathers on its back. It had a dark cap with shaggy feathers on the back of its neck. 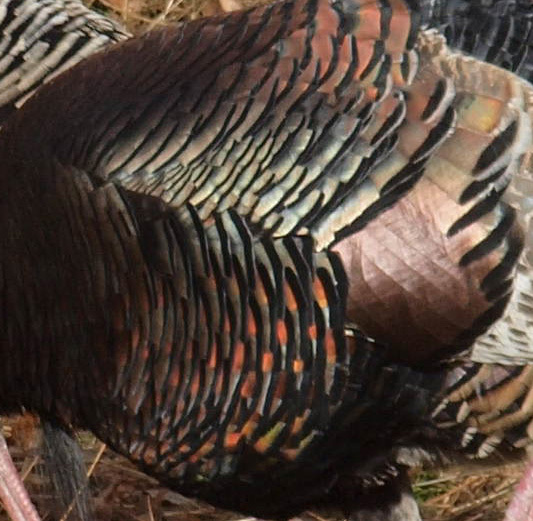 The head and neck were a chestnut color. Suddenly, without warning the bird struck. Its bill pierced the water and it came up with a minnow, neatly held at the tip of its bill. 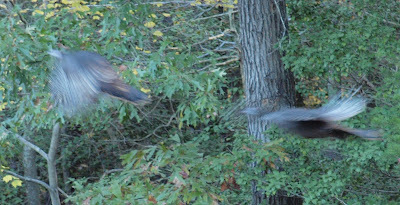 The bird quickly swallowed his catch and with a bold abrasive kyowk flew off, soon out of sight, around a bend in the river. I stood there watching in amazement, as the bird disappeared. What bird was that I asked myself? Later that day I was telling a neighbor who was a biology teacher about the strange bird. He went into his house and brought out a book about birds. 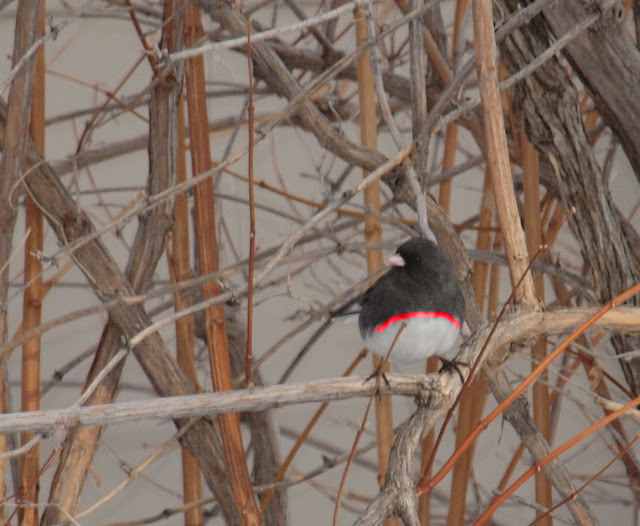 He instructed me to look through the book and see if I could identify the bird that I had seen along the river. Turning the pages of the field guide, I was impressed with the many beautiful birds that were illustrated on each page. There were so many birds and all new to me. They had names that I had never heard of before: crossbill, sapsucker, oriole and so forth. Suddenly, turning the next page, I saw the exact bird that I watched catch the minnow. Excitedly, I pointed it out, “there it is,” I said. "Why that is a Green Heron," he told me. I borrowed the book to study more about this and the other birds. The book was written and illustrated by Roger Tory Peterson, A Field Guide To The Birds. I studied the Green Heron's picture the rest of that day. What an amazing bird, I thought. What a great bird book with all manner of strange birds illustrated in it. That night at the dinner table, I announced to my family that I had seen a Green Heron while fishing. "What is a Green Heron," my father asked me. I pulled out my book and showed him the bird's picture. He stared at it and said, "I've seen this bird before. We always called them Mud Hens. I never knew their proper name." I was dumbstruck! As a young fellow, I thought that my Dad knew everything. To think that there was something that he didn't know and that I now knew was a very amazing circumstance. The following day, I showed my friends the bird's picture. None of them knew what it was. Well, now I was really onto something. I could study this book and learn about birds. Then I could tell my family and friends about them. I lead weekly bird walks throughout northern Utah and guide birders throughout Utah and other venues, such as Puerto Rico, Alaska, Arizona, Texas, Pennsylvania, New York, New Jersey, Delaware, Maryland, Nevada and California. 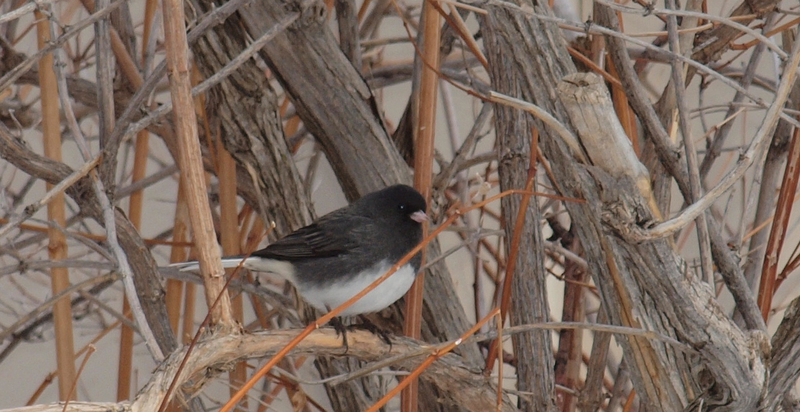 Where is your favorite place to bird in Utah? In the U.S.? in the world? Deseret Ranch, in northern Utah, Alaska and Caribbean. Deseret and Lytle Ranch in Utah are the two premier birding locations. 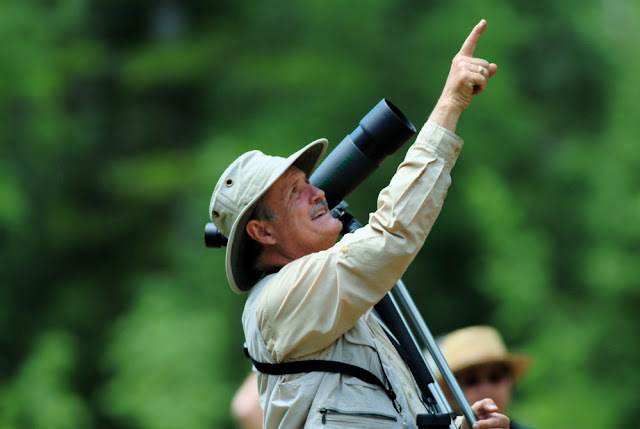 A field birder who delights in introducing others to the beauty of nature through birds. Swarovski binoculars and spotting scope. A journal and life list. I find it quite fun to read stories to my grandchildren of the adventures that I have enjoyed while on birding tours and trips that I lead. My favorite bird is the one with feathers. My hook bird story is one that I enjoy telling, since it was the beginning of a wonderful journey that I have enjoyed these last 60 years, as I bird my way around the yard, state and country. I feel compelled to own one of each. I have more than 100 field guides. The one that I carry into the field today is the small version of Sibley, the latest edition of the National Geographic and Kenn Kaufman’s North American Birds. My own Backyard Birds of Utah, by bill Fenimore and my other state Backyard Birds Guides that have been published: California, Florida, Georgia, Illinois, Maryland, New Jersey, New York, Pennsylvania, Texas, Virginia and Washington (www.Gibbs-Smith.com, Publisher). 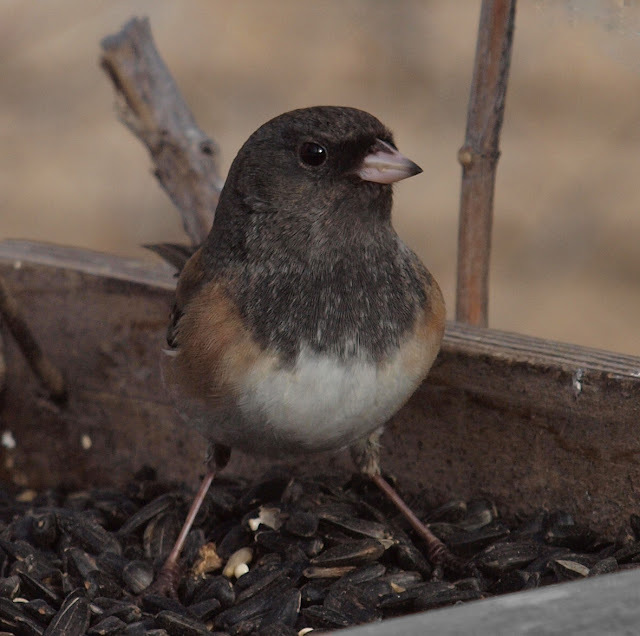 The other states are in production to complete a 50 state Backyard Birds Guide set. I would also recommend Scott Weidensaul’s , Living On The Wind and Clayton White’s, Peregrine Quest. 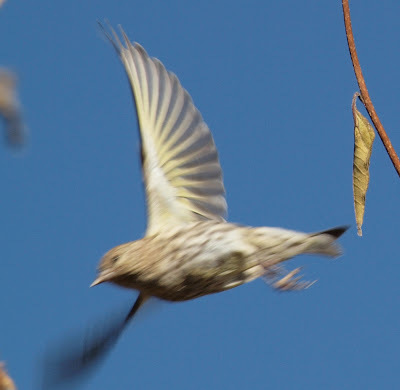 What motivated you to write the Backyard Birds series? After retiring from my professional career, I decided to open the Wild Bird Center. It is my retirement business (10 years this year). During this time, I have a wide range of traditional field guides that I sell to customers. Over time, customers would come into the store or call me on the telephone and ask me to help identify a bird that they had seen. Remembering the excitement that I had when getting help to identify my hook bird, I willing complied. Many of these folks had purchased field guides but were unable to find the bird of interest in the guides. The Guides I soon learned contained to much information and photos of "all" the birds nesting north of Mexico. What I soon discovered was they needed a bird guide that focused on the most common birds that they were likely to encounter in the backyard. Their backyards was the territory they were most interested in and field guides covered too many birds from all areas of the country. I searched for a simple guide to help them and could not find one. Over time, as I looked and talked with publishers, I realized the guide I wanted had not yet been written. 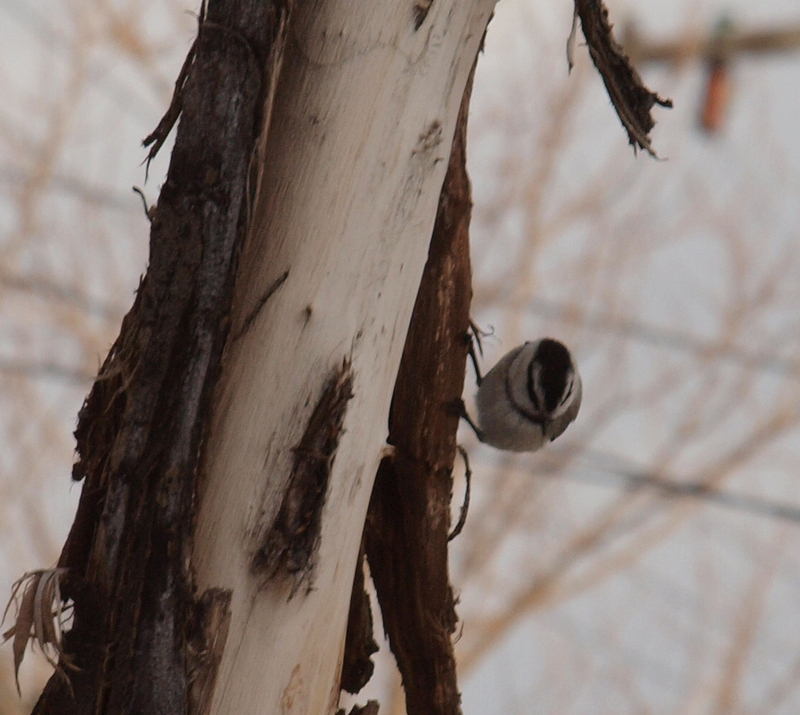 This is when I decided that I needed to design and write a Backyard Birds Guide. And the rest is history, as they say. Gibbs Smith is the publisher and the books (15 state guides completed and the others in production). 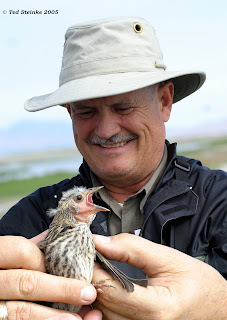 I studied birds through Cornell Lab of Ornithology, taken the Master Naturalist Class through USU, and completed a Naturalist course with the Utah Division of Wildlife Resources, as well as a life time of birding and learning in the field. 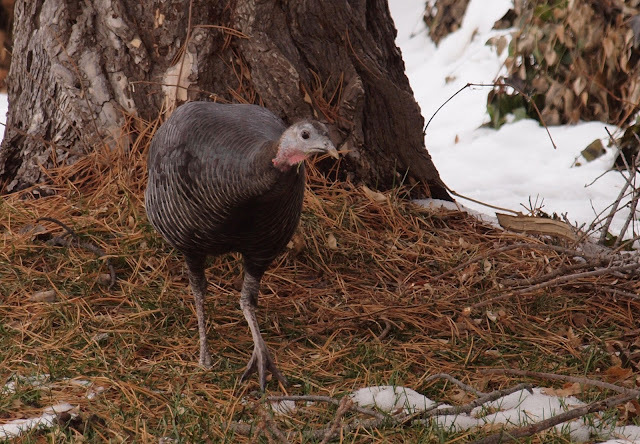 Leading several birding tours for those who want to get out and enjoy nature, particularly the tour that I will lead in July to Nevada’s Ruby Mountains for the Himalayan Snowcock. Audubon Society. 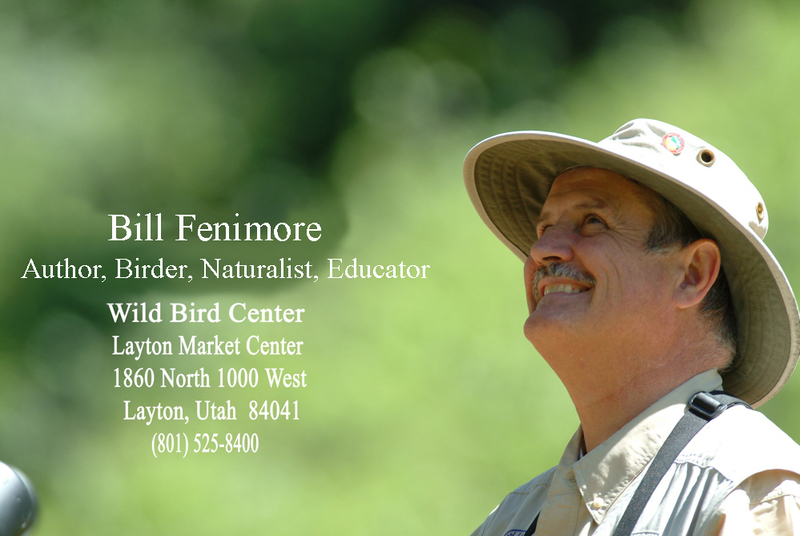 I served as the Utah Audubon Council Advocate from 2004-2009. So many birds, so little time . . . 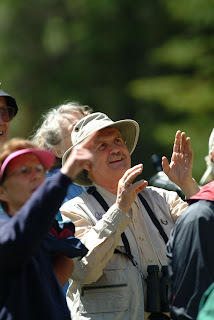 They all have a deep seated appreciation of nature that was nurtured through birding. Writing, speaking and operating the Wild Bird Center, Layton, Utah (www.wildbird.com/layton). Likely a raptor of some sort. 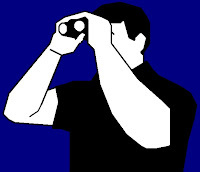 To introduce as many to the wonders of nature through the keyhole of birding. Bill Fenimore, author, educator, naturalist, columnist, writer, and field birder owns and operates the Layton, Wild Bird Center. 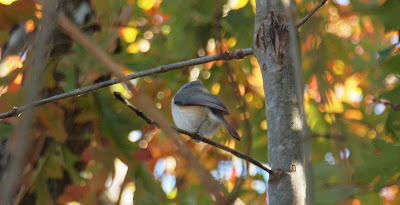 He is author of the 50 US State Backyard Birds Guide series on the joys and “How To” of birding. The American Birding Association bestowed Bill with the Ludlow Griscom Award its highest and most prestigious honor for outstanding contributions in Regional Ornithology, June 2008. In commemoration of the 100th anniversary of the birth of Roger Tory Peterson, The Roger Tory Peterson Institute of Natural History presented The Roger Tory Peterson Nature Education Achievement Award to Fenimore, July 1, 2008. He gives seminars and workshops on Backyard Birding Basics and Landscaping for Wildlife. Bill leads field trips on nature, with a bird focus through the Wild Bird Center. Fenimore was appointed by Governor Gary Herbert to the Governors Council on Balanced Resources, May 2010. Fenimore was previously appointed by former Governor Jon Huntsman to the Utah Division of Wildlife Resources Board of Directors in May 2009; Governor Huntsman had formerly appointed Fenimore to his Great Salt Lake Advisory Council; he is Vice Chair of the Utah Division of Wildlife Resources (DWR), Northern Regional Advisory Council. He serves on the Board of Directors of the Swaner Eco-Center, Utah Wildlife In Need (UWIN) Foundation and is a volunteer Naturalist for DWR. He previously served as the Utah Audubon Council Policy Advocate. 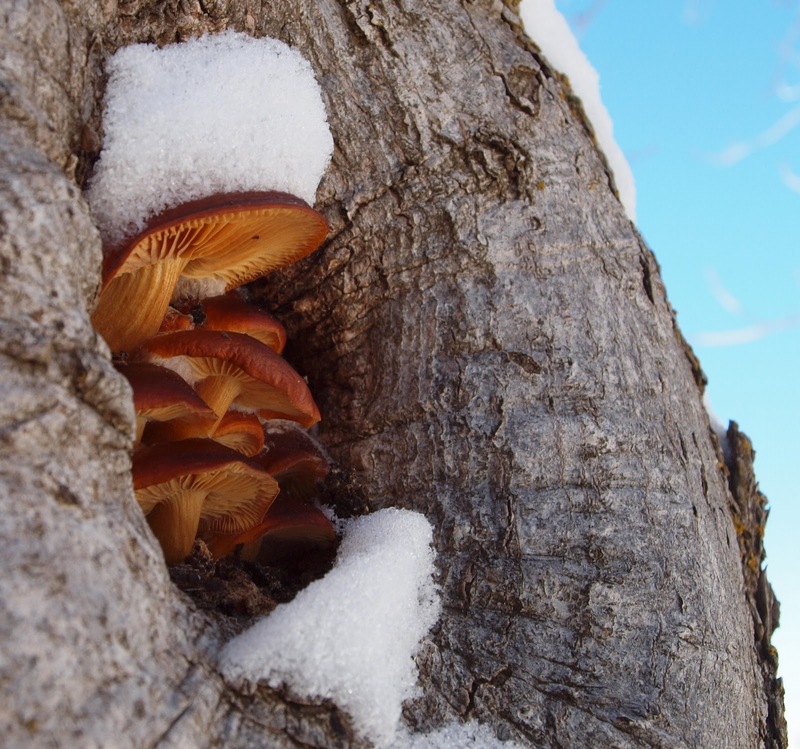 These mushrooms are growing in the tree in our front yard. Kinda cool! Here are some photos of me trying to be artistic with the shots. I was hoping to find some Smurfs too, but I dipped on them. Because nobody has been willing to try this out, I'll give some hints and see if anyone gets brave enough to give it a go! Welcome to my first photo I.D. challenge of 2011. Play not just to test your i.d. skills, but play to win! Whoever is the first to get all of these right, or whoever gets the most correct answers in the next week will win The North American Bird Reference Book, version 5.0 (on CD for your computer) by John C. Robinson, a $64.95 value! These photos were taken in several states including Idaho, Utah, North Carolina, and Virginia, so good luck! If you had The North American Bird Reference Book, you'd be able to narrow down the possibilities for each bird. 6. Photographed in Boise, Idaho, but don't let that throw ya! 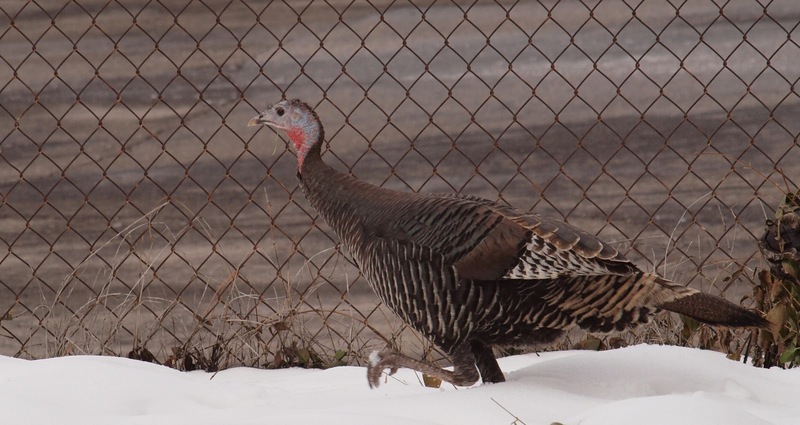 This was a vagrant in the middle of winter. 8. Photographed at a pond in Eagle, Idaho. 9. 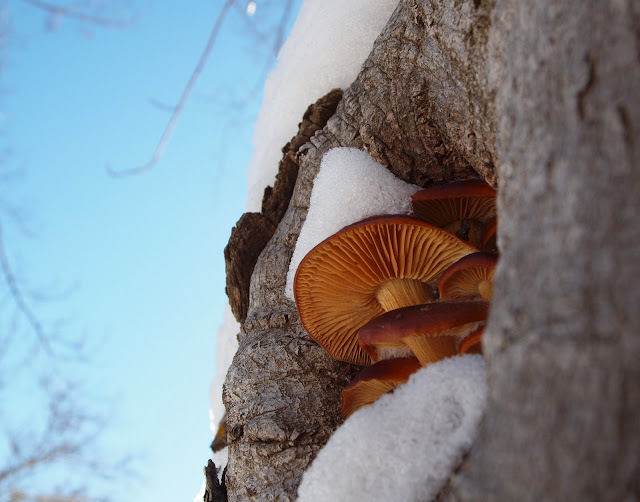 Photographed in Boise, Idaho. 10. 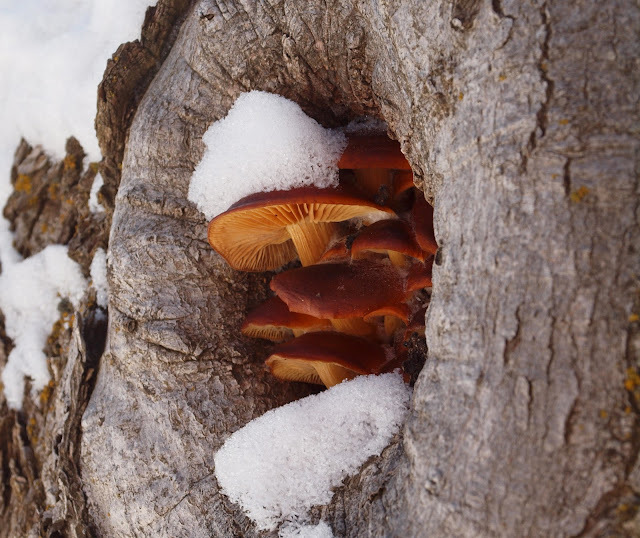 Photographed in the foothills of Boise, Idaho. 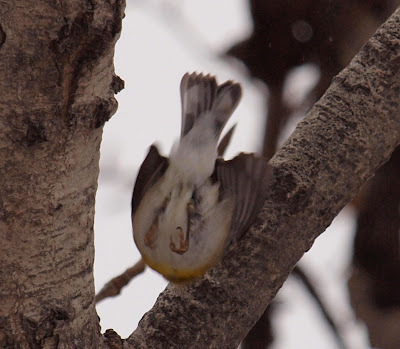 HINT: Regular followers of this blog will have a slight advantage as they may recall similar, but better photos of the same birds, and recognize the setting. If you are new to this blog, you've got a lot of catch-up work to do...well at least scanning through my blog posts going back until last summer. As of some one gently rapping, rapping outside my door. I've never heard a Raven tapping outside my door, but I often hear these tiny woodpeckers hammering away! 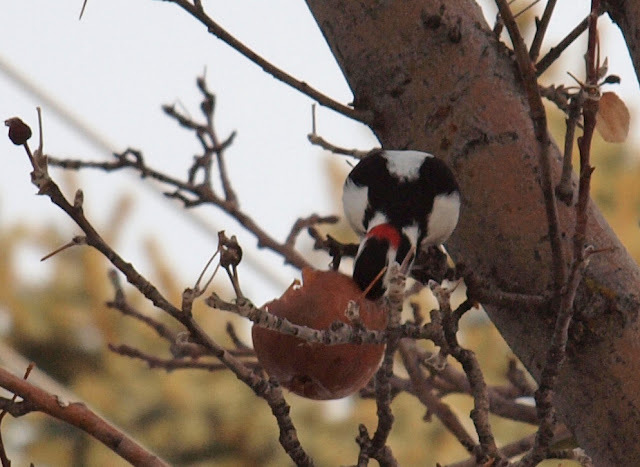 Downy Woodpeckers are among the most common and widespread woodpeckers in North America. Here he is enjoying a winter-softened apple. 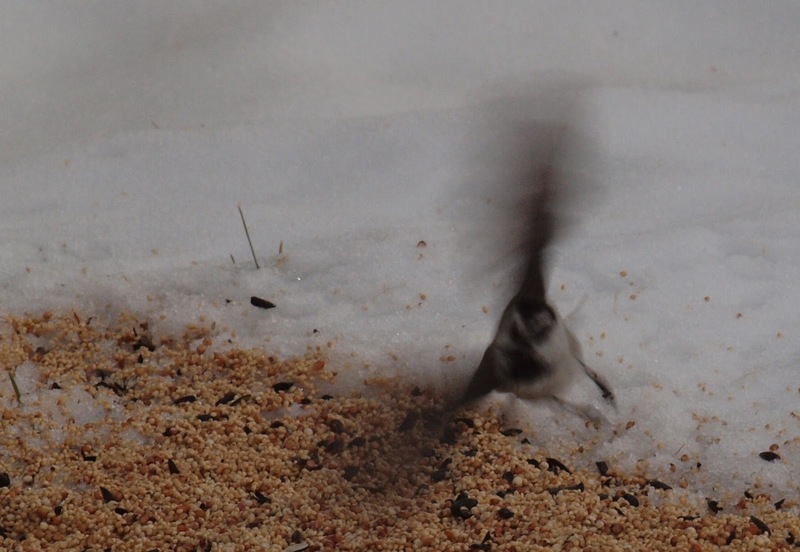 This is the first time I've had a Mountain Chickadee as a yard bird! 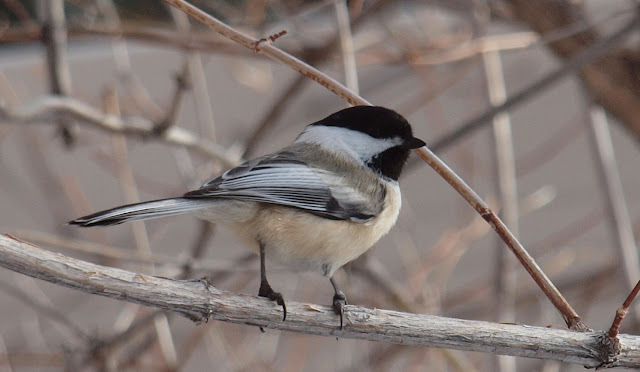 We have several Black-capped Chickadees around our home and I enjoy hearing them calling outside, even when I am indoors. 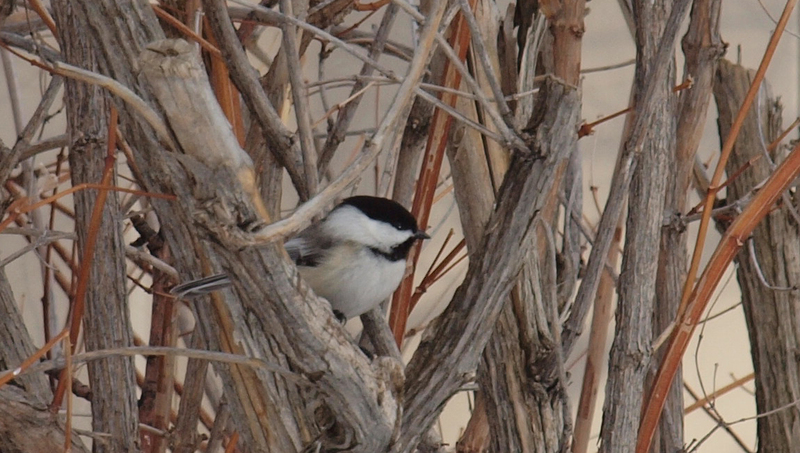 Chickadees just make me happy. 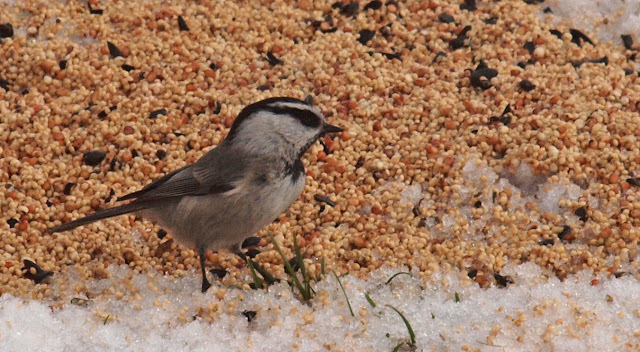 Having another kind of Chickadee in my yard is just cool! 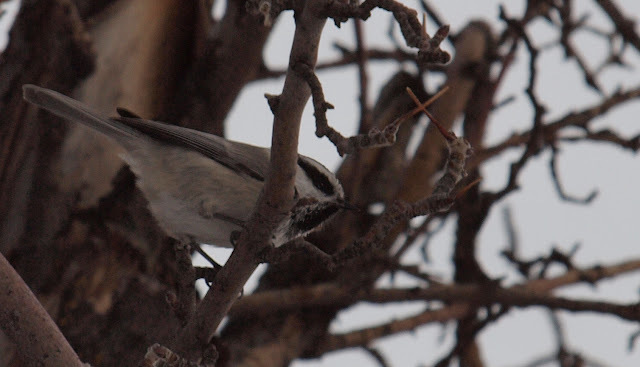 Identification of Mountain Chickadees is pretty simple. I just look for that white eyebrow. 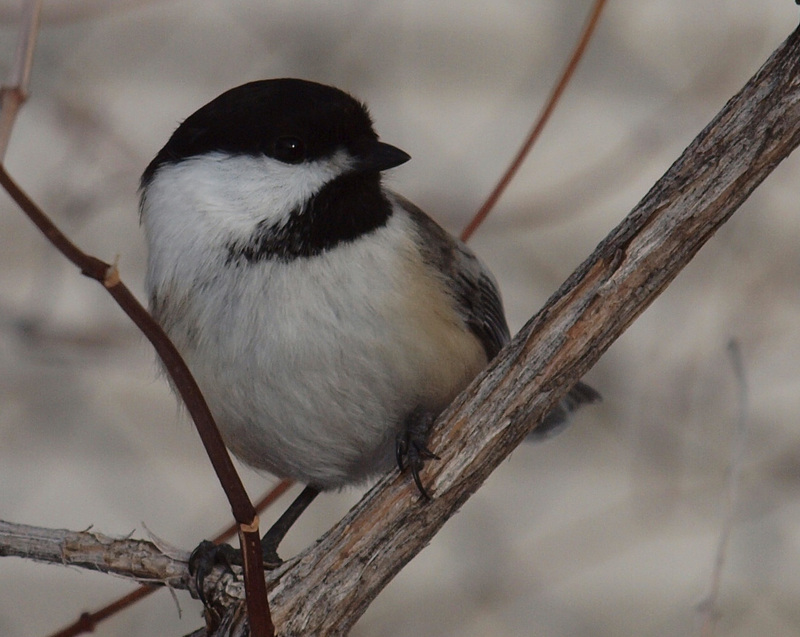 That is the easiest and quickest characteristic to separate it from all other chickadees. Their calls are similar to B-C Chickadees, but different. 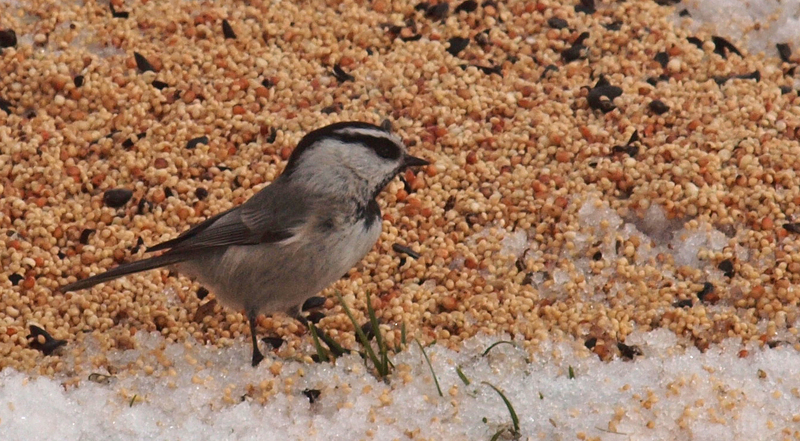 Mountain Chickadees seem to me to be a bit smaller too. 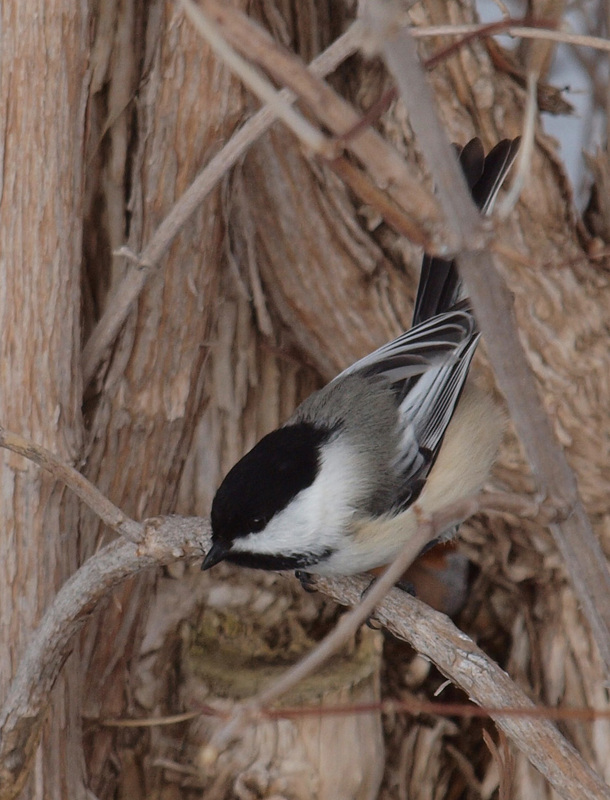 Here are a couple other views of the Mountain Chickadee I enjoyed in my backyard the other day. 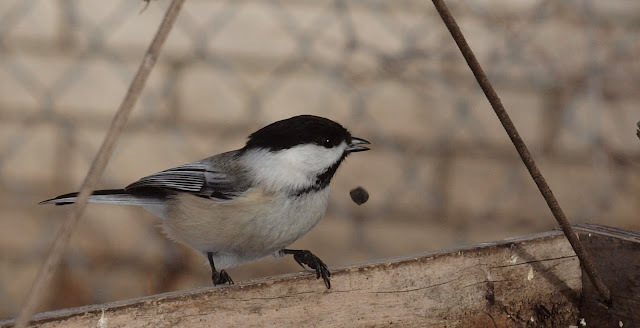 Here's a post from a few months back about Carolina Chickadees and how they compare to Black-capped Chickadees. 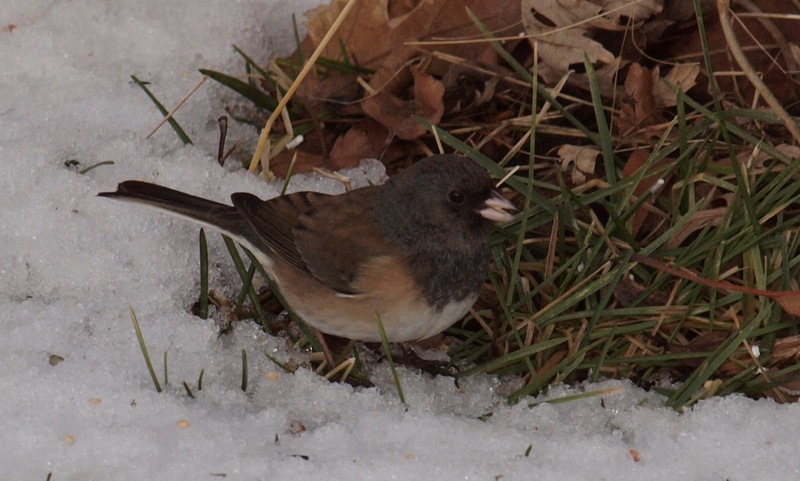 I just wanted to share a couple more photos of the Slate-colored Dark-eyed Junco visiting my backyard these days. 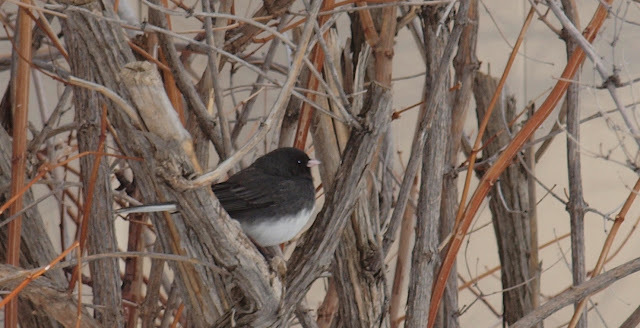 In Idaho and Utah, the Oregon race of Dark-eyed Junco seems to be the most common. Every now and then you find a Slate-colored Dark-eyed Junco in the west like this guy that showed up in my backyard. Notice how it has the dark flanks? 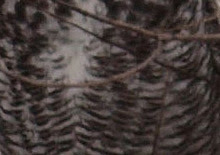 The feathers are basically just black or white. 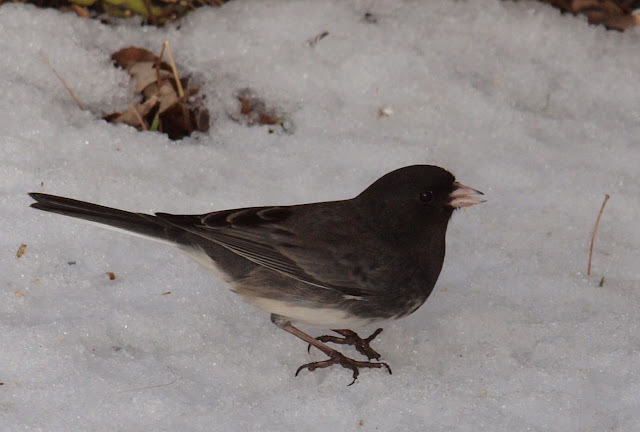 During my couple of months spent in the east last fall, I observed that almost all the Juncos were Slate-colored, with only the occasional Oregon. No matter where you live, when you get the less common Junco in your backyard it's a nice treat! Another tip I came across somewhere, that seems to hold true most of the time is that Slate-colored Juncos have a concave dark bib, while the Oregon has a more convex dark bib as emphasized with the red curves. 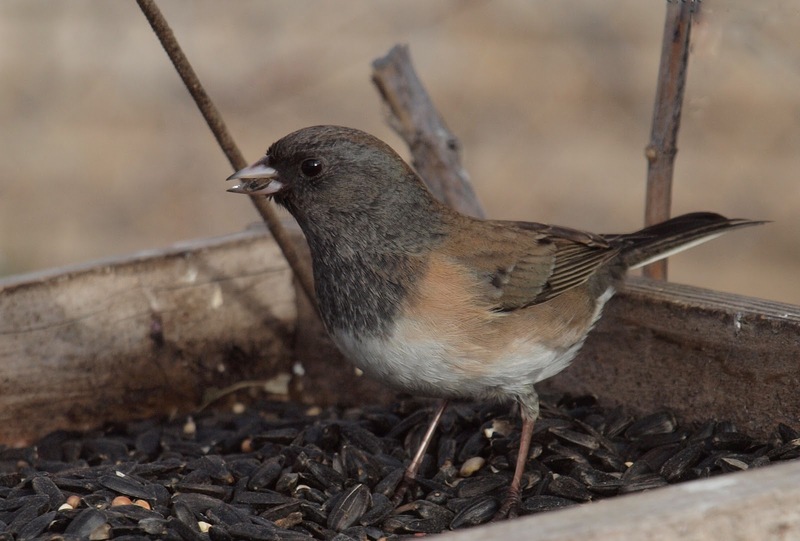 Oregon Dark-eyed Juncos have brown to peach flanks and more brown on the back and upper parts, so their feathers are all around more colorful than the Slate-colored. 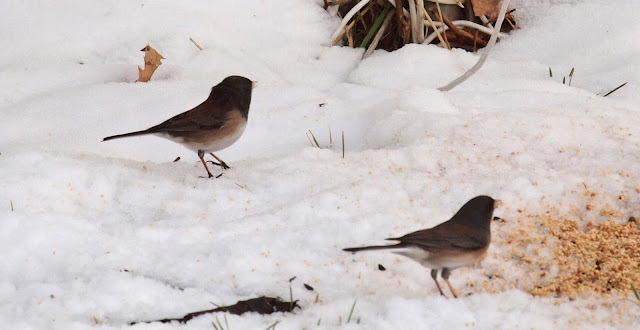 I'm not sure if it is true or just my perception, but it seems that Slate-colored Juncos are slightly larger and broader chested, and that's not just based on these photos. 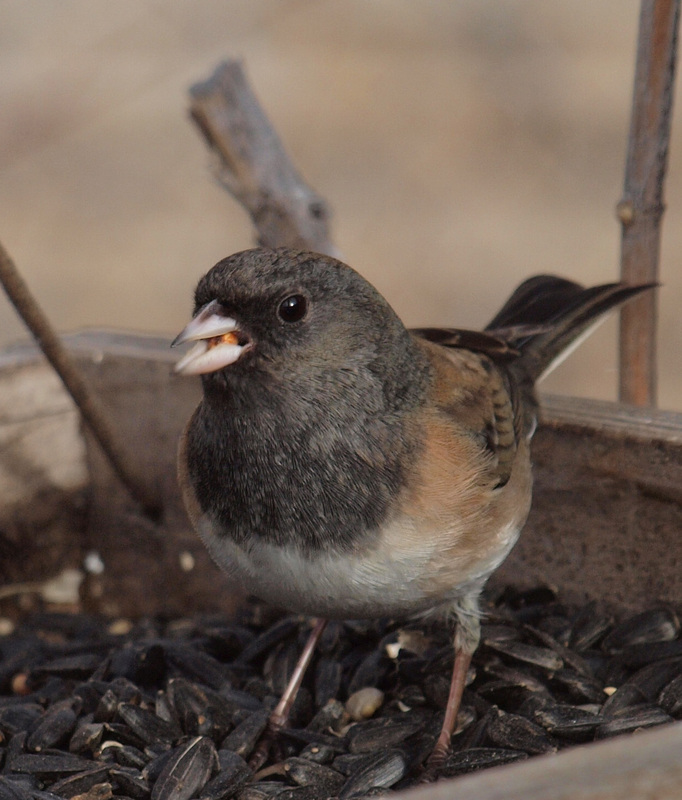 The first Dark-eyed Junco I ever saw was a Gray-headed in the mountains near Payson, Arizona. 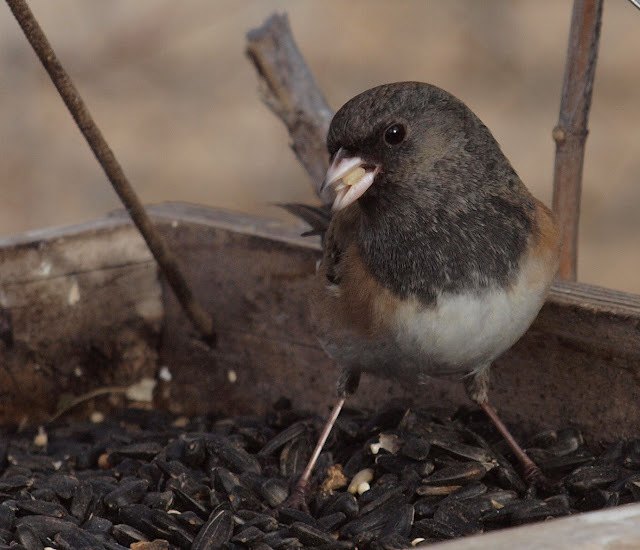 I was also fortunate enough to see a Yellow-eyed Junco at Ramsey Canyon, AZ which is considered a different species altogether. 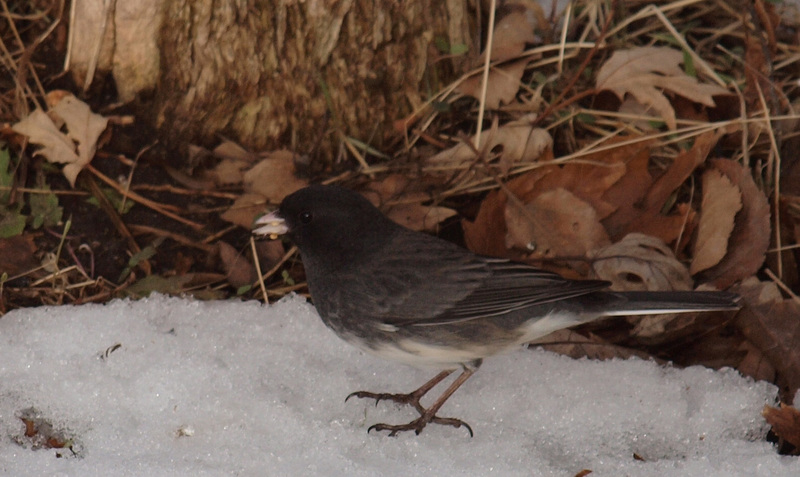 There are a couple other Dark-eyed Junco subspecies, but I don't recall if I've ever identified one in the field. Just another reason to keep on birding!